Back in mid-February 2013 (i know, try to remember back that far), on the heels of the (very public) hackings of the Burger King and Jeep Twitter feeds, Viacom siblings MTV and BET appeared to be the next corporate Twitter profile victims. Burger King's Twitter feed touted the sale of the fast food chain to rival McDonald's, complete with a McDonald's avatar and header image. While under the control of the hackers, BK's feed included obscenities, racial epithets and drug-use references. Similarly, Jeep's Twitter feed touted the sale of the Chrysler division to Cadillac. Much like the BK/McD fiasco, Jeep's feed included vulgar tweets and references to drug use while under the hacker's control. However, all was not lost for Burger King - their Twitter account gained over 30,000 followers while being run by the hackers. It's likely that stat, combined with the publicity generated by such public hacks, that prompted MTV and BET to give it a whirl. They decided to fake-hack each other. They gave it all the appearances of the previous hacks, switching avatar images, changing names and bios to reflect being "hacked" while peppering the Twitter feeds with unusual/out of character tweets (often promoting something from the "hacking" network). MTV and BET mocked those who "fell for it" by retweeting them. But something didn't smell right to members of the Twittersphere. The "hacker" tweets were merely friendly digs at the "hackee" … and both MTV and BET are members of the Viacom family. Turns out, it was all a joke (using quite a broad definition of the word "joke"). It was a PR stunt cooked up by the social media teams of MTV and BET. Others joined in, ripping MTV and BET for such a "lame" stunt, for a weak attempt to "stay relevant" and essentially asking to be hacked (for real) by using a fake hack as a publicity stunt. Never one to let a comedic opportunity pass him by, Stephen Colbert, host of The Colbert Report on Comedy Central, threw his hat in the ring, running a story about the BK hack (that it gained followers) and the MTV/BET PR stunt. 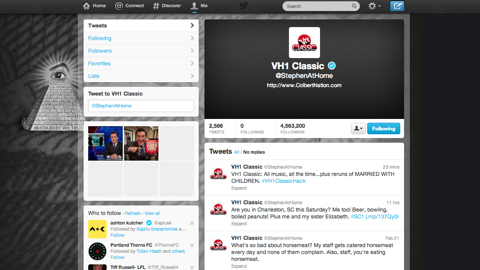 To skewer the practice, in turn mocking his own parent company (Comedy Central is also a member of the Viacom family), Colbert faked his Twitter feed (@StephenatHome) being hacked by fellow Viacom property VH1 Classic. The entire bit served to highlight the absurdity of the stunt, and how ridiculous MTV and BET looked for doing it. The take-away lesson here - Be Authentic.